As the Organisation of African Unity (OAU), founded in 1963, was established as a loose association of African states with limited mechanisms for implementing coordinated regional policies, managing conflicts and fostering continental peace and security, it experienced fundamental challenges to its raison d'être. Among these challenges – and arguably the most limiting challenge – was the decision to maintain an inviolable respect for a Westphalian conception of state sovereignty. This essentially meant that in order for the OAU to function at all it had to rely heavily on the political will of member states. The OAU’s limited Charter, together with its failure to stem the tide of civil wars and emerging dictatorships, eventually overburdened the institution, and in 2002 the African Union (AU) was established as its successor. The AU, while retaining much of the ideology of its predecessor, would be created with an eye to addressing shortcomings of the OAU while still promoting continental unity and a united front for Africa. Thus, the age-old goal of pan-Africanism had not entirely faded as the AU’s Constitutive Act came into force in 2001, with the Act making reference to the fact that it was “inspired by the noble ideals which guided the founding fathers. . .and generations of Pan-Africanists in their determination to promote unity, solidarity, cohesion and cooperation among the peoples of Africa and African States.” Thus, the objectives of the AU enshrined in the Constitutive Act includes fostering solidarity and respecting sovereignty, but also includes the promotion of socio-economic development, peace and security, democracy and good governance, human rights, sustainable development and global cooperation. In this regard, the AU’s Constitutive act represents a significant departure from the OAU which aimed to eradicate colonialism but made no mention of democracy and human rights. 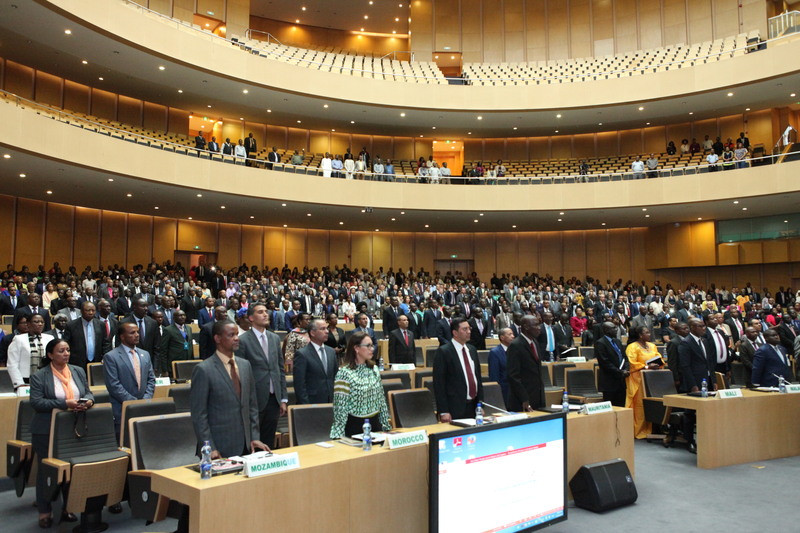 The Assembly, comprising of Heads of State and Government, acts as the supreme organ of the AU and meets annually. The Assembly is responsible for determining common policies, membership, and the establishment of institutions. The responsibility of deciding on matters of intervention rests with the Assembly. In comparison to the OAU, the AU Assembly possesses legal capacities to impose sanctions on members who do not comply with AU policies. The Executive Council, comprised of foreign ministers, is tasked with determining policies of common interest to member states such as trade, industry, resources, infrastructure and science and technology. Decisions are taken through a two-thirds member state majority. The AU Commission is the third organ of the AU, appointed by the AU Assembly to act as a secretariat to the Assembly, preparing documents and agendas. Inaugurated in March 2004, the Pan African Parliament was established to act as an oversight body to the executive functions, and to ensure grassroots participation and input of civil society (CSO) and non-governmental organisations (NGO). While the intention is for the PAP to become a fully legislative body, at present it is only able to exercise advisory powers through making recommendations and promoting the collective aims of the AU. One further oversight mechanism is ECOSOCC, the Economic, Social and Cultural Council, which consists of 150 representatives of social and professional civil society groups, is intended to provide civil society with a voice to influence AU policymaking. Permanent representatives of AU member states form the Permanent Representatives’ Committee, which is responsible for preparing work of the executive and acting as an advisory body. The Representatives also facilitate dialogue between member state capitals and the AU Commission. The AU further makes use of Specialised Technical Committees which are involved in the preparation and oversight of projects relevant to their areas of specialisation. The Technical Committees are comprised of seven committees with unlimited membership, including committees on agriculture, finance, trade and immigration, science and technology, transport and infrastructure, health, and education. The provision for a Court of Justice was adopted in 1998 and established via Article 1 of the Protocol to the African Charter on Human and People’s Rights on the Establishment of an African Court on Human and People’s rights. The jurisdiction of the court extends to cases submitted which involve the interpretation and implementation of the Protocol, and can include interstate disputes and the defence of human rights. Thus far, only 26 states have ratified the Protocol. Equally important for ensuring civilian protection and political stability is the Peace and Security Council, which entered into force in December 2003 through the Protocol Relating to the Peace and Security Council (PSC) of the African Union. The PSC includes fifteen member states and is tasked with maintaining and promoting peace and stability on the continent. The PSC is thus a tool for collective security, acting as a continental early warning mechanism for crisis response. The PSC is therefore responsible for determining the viability of peacekeeping missions and interventions in member states under Article 4. Unlike its predecessor, the AU has taken initiative to promote democracy and good governance. Its Constitutive Act states the AU’s aim, under Article 3(g), to “promote democratic principles and institutions, popular participation and good governance,” and nearly all institutions and organs of the AU reflect this goal. Given that the OAU was perceived by many as a ‘dictator’s club’ unable and unwilling to counter unconstitutional changes of government and authoritarianism, the African Peer Review Mechanism (APRM) is a further step in the right direction for the AU. The APRM is mandated to ensure Member States’ compliance with AU policies, but also as a means of creating a means of reviewing democratic, governance and human rights records of member states, by member states. Established as a means to correct the flaws in its predecessor, the AU has reconsidered its objectives to reflect the concerns of postcolonial Africa. Among those concerns was the imperative to counter low economic growth brought about by over-reliance on neocolonial trade with America and Europe through establishing intra-continental trade which would, theoretically, strengthen Africa’s entry into the global economic system. The AU has thus shifted its focus paradigmatically from state-centric economic control towards the goal of inter-African trade with the inclusion of the private sector. The New Economic Partnership for African Development (NEPAD), the brainchild of former South African President Thabo Mbeki, has been instrumental in assisting economic integration as well as Africa’s entry into the global economy from which it has been perpetually excluded and marginalised. As an instrument of the AU, NEPAD was adopted in 2001 by African heads of state with the core objectives of poverty eradication, the promotion of sustainable growth and development, and the empowerment of women. With unacceptably high levels of poverty and underdevelopment, NEPAD was designed to aid Africa in its Millennium Development Goals (MDG’s). While a number of these goals, including the promotion of women, healthcare and universal primary education have improved, others, such as the reduction of poverty and hunger, have been slow to progress. A further point of departure – one which has been a source of inspiration for much academic discourse – has been the move away from the principle of Westphalian non-interference in the affairs of member states towards a stance of ‘non-indifference.’ Article 4 of the Constitutive Act indicates a major shift from the OAU which stressed state sovereignty, to the enshrined ability of the AU to intervene in a member state under grave circumstances. Of particular import is Article 4(h) and more recently, 4(j) which allows for AU intervention under the circumstances of genocide, war crimes and crimes against humanity, and affords member states the power to request intervention in order to restore peace and security. Furthermore, unlike the OAU, the AU’s inclusion of a PSC and the subsequent provision for crisis response and management has granted the possibility for an ‘African solution to African problems’ approach. With Article 4(h) and the PSC, the AU is far more empowered to address the continent’s many conflicts and instabilities. However, while the legal framework exists, political will continues to hamper and drive calls for intervention. Nevertheless, the AU in partnership with international bodies such as the UN has made strides towards managing the multiple conflicts and insurgencies in Africa. Notably, the AU has played a major role in mitigating post/electoral violence in Kenya and the Ivory Coast, and has undertaken a number of hybrid missions together with the UN. The AU frequently sends observer missions to monitor elections in member states under the African Charter on Democracy, Elections and Good Governance (2007). The AU’s self-appointed ability to intervene in the sovereign affairs of a member state under Article 4(h) has arguably afforded the organisation a far more pragmatic means of addressing the continent’s numerous inter and intrastate conflicts. It has also, however – particularly with the inclusion of 4(j) which allows member states to request intervention in their own state or in another – become point of contention as states struggle to relinquish their conceptual grip on sovereignty. The addition of the AU’s objectives of ensuring democracy and good governance does not sit well with some who consider 4(h) and 4(p) to be a means for the AU to meddle in sovereign affairs and instigate regime change. Per contra, the fact that member states may request AU intervention has attracted criticism that heads of state may waive the intervention flag in an attempt to maintain a hold on power in the event of civil uprising against repressive authoritarian regimes, or in an attempt to destabilise or force regime change in another state. According to the PSC Protocol, a member state which is part of the PSC may not engage in decision-making or discussion on matters of intervention in that state. However, as illustrated by Sudan’s obstruction of decision-making on the Darfur issue, and by Ethiopia which was party to PSC discussions on the Somalian conflict (in which Ethiopia was involved), the Protocol is not strictly adhered to which calls into question the PSC’s impartiality. One further shortcoming in the AU’s Constitutive Act is that while Article 4 affords the AU with intervention powers, it makes no mention of the United Nations Security Council’s (UNSC) endorsement of interventions, thus bypassing the UN Charter which stipulates, under Article 53, that no state may undertake intervention without the explicit authorisation of the Security Council. This implies the potential for tensions between the UN and the AU, particularly in light of the UN’s reluctance on the issues of intervention and the use of force (which are not unwarranted, given the disastrous unfolding of interventions in Rwanda, Srebrenica and Somalia). Unfortunately, despite the existence of the APRM and the AU Member States’ theoretical commitment to democracy and good governance, Africa has since seen several violations of constitutions, electoral fraud, human rights abuses and the suppression of civil and political rights. Most recently illustrated by the Arab Spring, the crisis in Darfur, pre-electoral political instability in Burundi and Kenya, and the relapse of violence in the Central African Republic in 2013, the AU has clearly struggled to execute its self-imposed mandate of facilitating democracy, good governance, peace and stability. Many African countries lack basic separation of powers as power is centralised in the executive (Zimbabwe), which allows for the ruling party to maintain dominance, dominate state resources and place those loyal to the regime in places of power. Judicial independence is thus rendered problematic and corruption is endemic. Thus, the APRM may provide the blueprint for addressing corruption and poor governance, but the fact that membership and reviews are voluntary again leaves its efficacy in the hands of political will and Heads of State who must make the decision to comply with international laws and regulations. A number of AU member states have as of yet failed to sign and ratify the objectives of NEPAD, which is required for the APRM to perform its duty. This, together with the APRM’s lack of inclusiveness of civil society has led to criticisms of the APRM as a ‘toothless’ body. As with the OAU, funding and resources has been a perpetual bane of the AU, which requires finances to fund the operationalisation of its institutions and the fulfilment of its mandate to promote peace and security. To this end, the AU’s Peace Fund draws on appropriations from within its budget, voluntary member state contributions, and voluntary contributions from within and outside of the continent. Member states are required to pay membership fees, which is often impossible due to the poor state of most African states’ economies. While the EU has been an invaluable source of funding for the AU, reliance on external aid renders the AU susceptible to outside interference and restrictions (for example, when the AU requires funding for a peace operation, it must first seek the permission of the EU Commission and the EU Political and Security Committee). Clearly, Africa’s many conflicts severely inhibits attempts at integration and collective security. These conflicts drain state resources, threaten political stability and result in human rights abuses and humanitarian crises on a massive scale which disables state cooperation and development. Thus, while the AU is a major improvement – both legislatively and structurally – on the OAU, a number of significant challenges remain. The AU’s regional economic integration initiative is arguably the most significant challenge as well as the most urgent, which will require a paradigmatic shift in the way governments conceptualise sovereignty. Political will acts as a further impediment to the achievement of the AU mandate, particularly as the AU lacks significant authority to enforce member compliance. Nevertheless, the African continent – civil society in particular – has demonstrated (as in the case of Burundi’s recent electoral violence and the Arab Springs) the desire for strong, accountable and transparent institutions, governments and democracy. In the spirit of optimism, perhaps this desire will catch fire and spur the AU to shun complacency and continue to promote good governance, the rule of law and the active participation of civil society. • Arowosegbe, JO. 2011. Claude. E. Ake: Political Integration and the Challenges of Nationhood in Africa. Development and Change, 42(1): 349-365. • Bankie, FB. 2010. Antithesis: the reconstruction of the African Union for a viable and sustainable solution for the unity of Africans. International Journal of African Renaissance Studies, 5(1): 123-137. • Brookings Institute. 2015. Foresight Africa: Top Priorities for the Continent in 2015. African Growth Initiative. • Fagbayibo, B. 2013. Looking Back, Thinking Forward: Understanding the feasibility of normative supranationalism in the African Union. South African Journal of International Affairs, 20(3): 411-426. • Farmer, LJ. 2012. Sovereignty and the African Union. The Journal of Pan African Studies, 4(10):93-105. • Gebe, BY. 2008. The quest for a union government of Africa: Reflections on the vision and the realities of political integration. South African Journal of International Affairs, 15(1): 41-53. • Gebrewold, B. 2010. The Cynicism of African Solutions to African Problems. African Security, 3(2): 80-103. • Harshe, R. 1988. Reflection on the Organisation of African Unity. Economic and Political Weekly,23(8): 373-376. • Mangu, AM. 2014. The AfricanUnion and the promotion of democracy and good political governance under the African Peer Review Mechanism: 10 years on. Africa Review, 6(1): 59-72. • Moller, B. 2009. The African Union as a Security Actor: African Solutions to African Problems? Danish Institute for International Studies, Working Paperno.57. • Nathan, L. 2010. The African Union and regional organisations in Africa: communities of insecurity. African Security Review, 19(2): 106-113. • Williams, PD. 2007. From non-intervention to non-indifferece: the origins and development of the African Union’s Security Culture. African Affairs, 106:253-279. • Yihdego, Z. 2011. The African Union: Founding Principles, Frameworks and Prospects. European Law Journal, 17(5): 568-594.